"I want kids to lose themselves in the worlds I create and recognize themselves in my characters." For Janey, spending a few days before Christmas in Banff, Alberta with her grandmother wouldn't be so bad. The problem is, Granny's new beau, Charlie's there, and Charlie's invited his annoying grandson Max to come along too. ​The other problem? Janey's being sucked into the past again and she can't figure out why, even when Max accidentally comes along too. 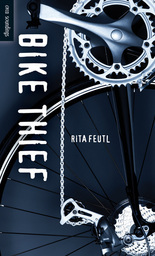 To repay a debt, Nick learns to steal bikes, but the stakes keep growing and so does the violence. Can Nick save himself and the other kids? Daisy's birthday is coming up and she needs a bigger bedroom for all the presents on her list. ​Based on a central European folktale. Janey doesn't want to spend a summer visiting her grandmother in Edmonton. and ​learns she must stop a disaster. information, ​historical context, exercises and lesson suggestions.